Within The Ames Library’s 4th floor department called Tate Archives & Special Collections are thousands of unique materials and all are available to benefit people in the IWU and surrounding communities. 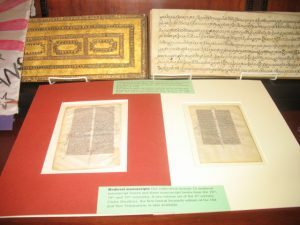 Our collections include 12 medieval manuscript leaves and three manuscript books from the 16th, 18th and 19th centuries. A two volume set of the 4th century Codex Sinaiticus, the first bound facsimile edition of the Old and New Testaments, is also available. (L) a Bible in Latin, on vellum, with contemporary glossing. England, ca. 1220. (R) a Bible in Latin, on vellum, with decorated initials and marginal penwork, including a scribe’s use of the pointing finger. The text is from Zachariah. Italy, Bologna, ca. 1280. This display holds just a small portion of the kinds of materials found in Tate Archives & Special Collections. These collections are in a variety of languages and formats (artifact, book, manuscript, and media) and creation dates range from the 11th-21st centuries. Some collections are completely described and identified and some have yet to be thoroughly organized or examined. Although many holdings do have a direct connection to the University, many are distinct and unrelated to the others such as the supporting materials for research on the people who created and collected the pottery and basketry items displayed in the entry level rotunda. Curious minds seeking inspiration for creative works and original research are welcome to stop by and explore the possibilities! This entry was posted in Cultural Studies, Research files, Unexplored collections and tagged Book Arts, history, Manuscripts, religious texts, Special Collections by njett. Bookmark the permalink.